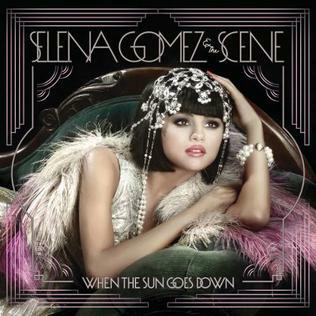 Selena Gomez is doing a lot of dropping lately: She parted ways with today's biggest pop star Justin Bieber, swore the upcoming Wizards of Waverly Place reunion special is her last stint with the Disney show, and now she's dropping the backing band on her last three albums. In an interview with The Wall Street Journal, a rep for Gomez confirmed she'll release her next album solely as Selena Gomez. Most likely, this news is for the best: Selena Gomez & The Scene always felt like a weird grouping with the band having virtually no identity while backing such a huge public personality. The Scene never established themselves as a cohesive music unit either, the group's singles dabbled in everything from boppy, catchy rock-pop to minimal EDM to Top 40 synth-pop. They didn't even appear on any of their three album covers. Count em: One Selena, two Selenas, three Selenas. No Scene. Gomez also told WSJ she's planning for the album to come out this summer (! ), followed by her first world tour (!!). Gomez going solo is another mature career move, as the Disney starlet continues to grow up. Before the month is out, we'll see her racy role in the upcoming R-rated flick Spring Breakers and her final appearance on Disney's Wizards of Waverly Place via a reunion special. As ex-boyfriend Bieber continues his questionable behavior, Gomez is doing her best to prove she's not a girl. But is she a woman?